Do you ever find yourself struggling to buy the right gift? Some people seem impossible to shop for, but there are some food-related gifts that just about anyone will love. The best part is, many of these are as easy to buy as getting online and clicking a button. Here are some ideas for the food lovers in your life. Flowers are great, but who wouldn’t love receiving a bouquet of candy. 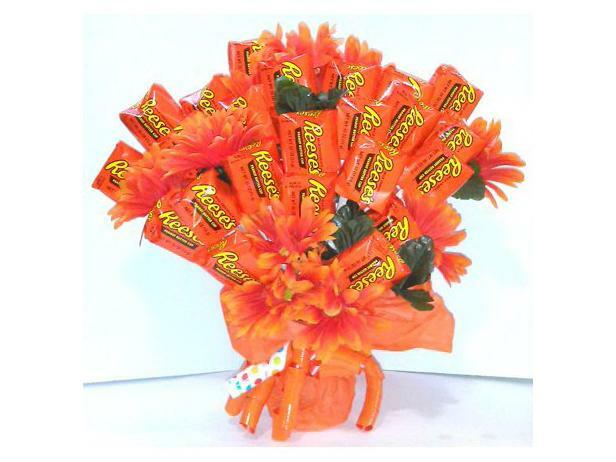 Imagine your loved one’s delight when a reese candy bouquet shows up at his or her door. Candy bouquets are great for birthdays, holidays, or just to let someone know you’re thinking about them. With so many different types available, there is something for everyone. If you know someone who isn’t that into candy, consider a cookie bouquet instead. If you’re looking for a gift for a grill master, this is the way to go. There are so many different bbq sauces that you’re sure to find the right one for each of your friends and family. If you’re feeling ambitious, consider creating and jarring your own sauce. You can even go online a create a custom label. Your loved ones are sure to appreciate the extra thought. Try creating your own cookbook for a personal touch. You can use your own favorite recipes and have them bound as a gift for a friend, or gather all of your mom’s recipes and have them made into a cookbook for her. If you’re looking to go the more traditional route, try finding a cookbook to suit the dietary needs of whomever the gift is for. There are cookbooks out there for just about every category you could imagine. Gift buying should be fun, not stressful. These ideas will make gift giving simple and stress-free. As a bonus, they’ll probably have your loved ones talking about how thoughtful you are for years to come. … Read More..